Some of you may have heard about the Charter bid for TWC being rejected (again). Or that the DC Circuit court ruled with Verizon against the FCC like it did in 2010 in siding with Comcast. Net Neutrality is officially dead. TechDirt has a good look at NN. Some interesting numbers came out recently. Investor's Business Daily did an interview with Robert Mudge, President of consumer and mass business markets @VZ. New FiOS service is called Quantum with Internet speeds of 50 to 500 Mbps. "40% of its FiOS Internet customers had signed up for Quantum speeds." VZ's "entry-level FiOS service, like those of many cable TV rivals, provides download speeds of 15 mbps." VZ "spent $23 billion to build its FiOS network, leading to questions about return on investment. But FiOS business now accounts for 72% of its consumer revenue." "Today we're north of 15 million homes that we can sell to. We'll continue to grow that at a pace of 700,000 to 750,000 homes per year." Mudge: "The pay-TV market is shrinking. It's a slow shrinkage. The video offering, at this point, is not how you keep and hold the home." I think I have been saying that for a while. Cord cutting is hitting the cable companies to the tune of -3% per quarter for Comcast, TWC, Charter, Cablevision. DISH is losing to DirecTV. ATT, VZ have TV subscriber net adds. Five years ago, cable was making about $10 per TV subscriber. It's unclear what it is today. DirecTV in US operations: "The total subscriber base was about 20.2 million by the end of the quarter, up from about 20 million a year earlier. Revenue in the region rose 7% to $6.17 billion," via WSJ. That's $305.44 per sub per quarter, which fits the ARPU of $102 that DTV reported to Bloomberg. 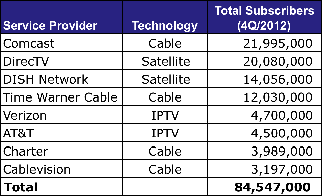 Net income for 3Q2013 for DTV was $699 million, which is $34.60 per sub or $11.53 per sub per month. One thing to note is that cable cowboy John Malone, chairman of Liberty Media, bought a 27% stake in Charter for $2.6B in order to consolidate the cable companies. Malone is urging Charlie Engen at DISH to merge with DTV. Consolidation is needed for 2 reasons: negotiation power with content companies and operating efficiencies. I think the efficiency thing is a joke. It never happens and it crushes both brand and employee morale. Negotiation power is over. CBS proved it by making TWC cable bend in 2013. Subscribers dropped both TWC and DirecTV in 2013 over channel black-out/disputes, but both saw revenue growth despite subscriber losses!!! GigaOm: Broadband looks a lot like TV! Cable TV economics at Forbes, at Blouin.